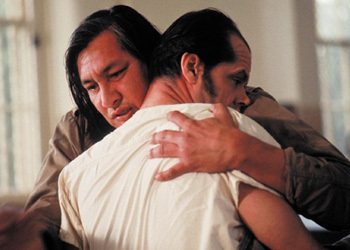 There’s something about the touching relationship between Randle McMurphy (Nicholson) and Chief Bromden (Sampson) in One Flew Over the Cuckoo’s Nest that’s so touching, so intimate, that their every scene together in the film is emotionally highly charged. Little dialogue is spoken between them, yet emotions are right there on the surface of these two wretched souls. Put away in an insane asylum, McMurphy brings life back to the mute Indian named “Chief.” The simple act of offering a piece of gum to him elicits a vocal response, the first time Chief has ever spoken in that painful place. Chief’s poignant response to lobotomized McMurphy is one of the most sensitive and achingly beautiful scenes in movies. They were amazing co-stars in Thelma and Louise, playing off each character’s defects as well as virtues throughout the film. 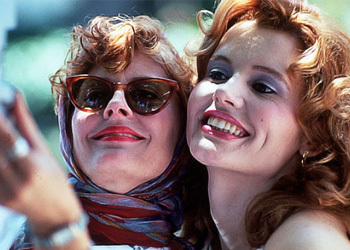 Though Thelma and Louise was the only movie they starred in together, their onscreen partnership is remembered on many lists of best movies. The only comparable scene in movies where two characters look into each other’s eyes with such intensity and understanding, knowing that death is imminent, would be Beatty and Dunaway in Bonnie & Clyde. There was something about that last look between Sarandon and Davis just before they clasped hands and sped toward their deaths that lives forever in the mind of movie lovers. 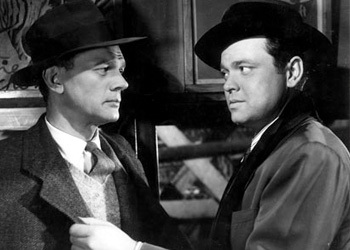 These two talented actors’ on-screen chemistry in The Third Man, Citizen Kane, Journey into Fear, and The Magnificent Ambersons works because they complement each other, whether their characters are buddies or adversaries. As real-life best friends, their camaraderie and long association make for an easy-going, successful film partnership. There’s an ease of manner and believability between their characters in every picture, allowing the audience to feel as though they aren’t “acting” but simply living, as in The Third Man’s most memorable scene on the Vienna ferris wheel with arrogant Harry Lime (Welles) pretty much improvising the famous cuckoo clock monologue to Holly Martins’s (Cotten) sublimely subtle shock. In Sideways, old college buddies now on the verge of “manopause” spend a week romping across California’s vineyard country sampling wines, food, booze and women. Giamatti imbues his character with such dimension that we don’t care that he’s a divorced, middle-aged, alcoholic, woebegone-wannabe-writer-turned-teacher who only visits his mom to get money. Conversely, best bud Jack loves women the way Miles loves booze, and is a happy-go-lucky, washed-up actor, who’s getting hitched and for whom this trip is his “last week of freedom.” “My best-man gift to you is to get you laid,” says Jack to the virtually unlayable Miles, who’s still pining for his ex-wife. Winetasting discussions with two women they befriend become a revelatory metaphor for their inner Selves. 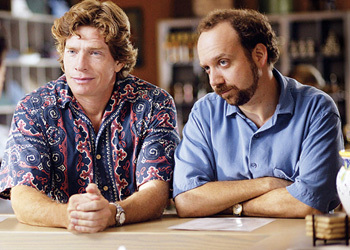 Giamatti and Church give us two characters who are genial, funny, and very moving. 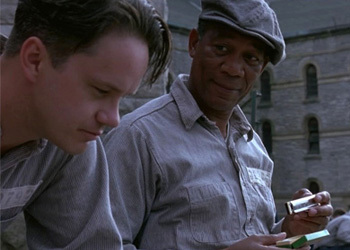 A warm relationship slowly develops between the characters of Andy and Red in The Shawshank Redemption as their mutual respect grows during incarceration. This would not have been possible with actors with lesser charisma than Freeman (Red) and Robbins (Andy). They exude brotherly affection and one wonders what would have happened had the original choices for Red been cast. They included Harrison Ford, Paul Newman, Robert Redford, and Clint Eastwood, but director Frank Darabont could not see anyone else but Morgan Freeman in the role, even though the part had been written as a “red-headed Irishman.” Freeman made Red “feel real.” The role of Andy Dufresne was originally offered to Tom Hanks and Kevin Costner. Fine actors all, but Robbins and Freeman are actors who will prevent you from ever being able to imagine anyone else in their roles. 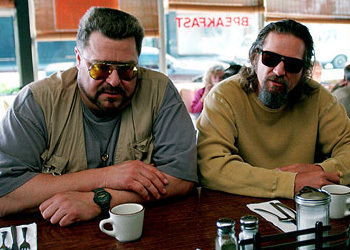 The Big Lebowski‘s The Dude (Bridges) and his sidekick, Walter (Goodman), have a kind of karmic glow between them. Dude is a hippie burnout who smokes doobies and cares only about bowling, while Walter, his gun-enthusiast buddy, sandwiches his hostile Vietnam recollections into every conversation. Walter instigates an investigation by philosophical, gentle Dude into the whereabouts of the real Lebowski in order to locate the perps who peed on Dude’s rug. 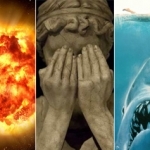 The urine “really tied the room together,” observes the Dude. The role of Walter was written for John Goodman (who had already starred in Coen Bross. movies Hudsucker Proxy, Barton Fink, and Raising Arizona) and, as soon as Jeff Bridges’s name even came up, he had the role of the Dude. While the Coens waited for both actors to complete prior commitments, they found time to do Fargo. 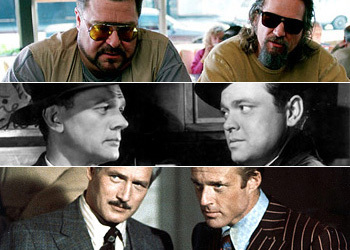 Bridges and Goodman were a dynamite combo who helped raise this film from good to classic to masterpiece. The Dude abides. And so does Walter. Belushi and Aykroyd, best buddies in real life since the day Second City Chicago’s Belushi discovered Second City Toronto’s Aykroyd, through SNL days and nights, partnered up for the The Blues Brothers movie and infused it with their monumental talent and charisma. 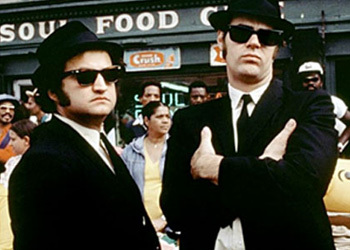 The Blues Brothers were originally created to warm up SNL audiences pre-show; then, after much pestering by Belushi, Lorne Michaels finally upgraded the act into the show itself. After that, The Blues Brothers made a hit record, were the opening act for Steve Martin at Universal Ampitheater (I was there), and finally, Belushi and Aykroyd did the film. Watching The Blues Brothers is like being invited to join in with two real buddies having a fun time. After that, every cool kid in America was wearing a pair of Ray-Ban 5022 Wayfarers. There’s no denying the mischievous camaraderie between these two stars of Butch Cassidy and the Sundance Kid and The Sting. They seem to have a secret language going for them resulting in the fun these two stars have together onscreen, playing a pair of lovable rascals with charm and wit in both films. 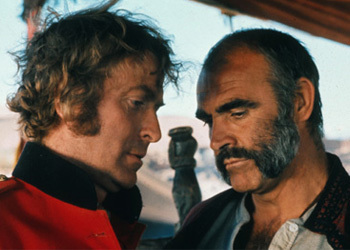 Butch and Sundance’s conversation before they leap off the cliff and the conspiratorial glances between the actors in The Sting are evidence of their close relationship. 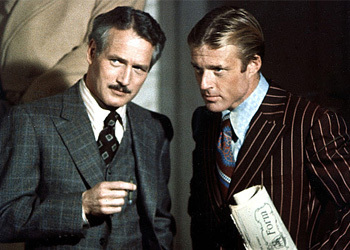 The leap scene in Butch and Sundance was attributed to a scene from 1939’s Gunga Din, said iconic screenwriter, William Goldman, who had seen it in his youth. The real Butch got his nickname from having been a butcher in Wyoming, while Sundance got his name from a Wyoming jail where he had served time. Beatty and Brando were considered for Sundance, as well as Steve McQueen, who didn’t like the billing. Jack Lemmon turned down the Sundance role because he didn’t like riding horses. Newman was the only actor ever thought of as Butch, although he at first toyed with the idea of playing Sundance. There had been talk of Newman and Redford buddying up again in a third film but, unfortunately for their legion of fans, it never came to be. 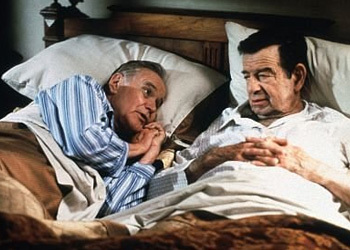 Hollywood struck gold with the zany, offbeat and prolific movie couple, Lemmon and Matthau, who made 10 films together, including The Fortune Cookie, The Odd Couple, and Grumpy Old Men. Their legendary chemistry makes the audience feel they know both actors personally and are able to “share” in their onscreen fun. Each actor was a star in his own right, dramatically and comedically, and together, they made motion picture history. Lemmon directed Matthau in Kotch, his only directorial effort, resulting in Matthau’s nomination for Best Actor Oscar. After The Fortune Cookie, Lemmon said “Boom, from that first scene on, it was like silk working with him … like butter melting.” That’s a pretty good assessment of their work. 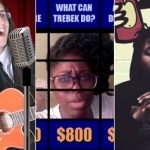 If you know any other movie buddies not on this list, please add them under comments. what bout richard gere and susan sarandon they have acted in alot of movies together and they are always super!! @billie isbell: Since Sarandon was already listed on one of the buddy movies (Thelma and Louise), I felt it would have been unfair to list her twice.